After more than a decade of considerable effort, beginning around 2006, of fashioning a future for what were then called Delta Gamma Theta (fraternity) and Tau Delta Phi - Delta Gamma Theta Alumni Association, the question before the membership is are we on the right track? Should we continue and refine or should we radically change our strategies over the next five years? More than a year ago DGT announced a design competition open to its membership. As a fundraising effort DGT endeavored to ask members to make a monetary contribution of $100 that would involve purchasing bricks engraved with their name or that of a member they would like to honor or remember. The campaign itself has generated $2,000, a good beginning. Two design entries were received, one from Tom Wong, Treasurer, and one from Vern Ford, immediate past Secretary. A resolution was proposed and passed, with both abstaining, to combine elements of both designs into one design solution. DGT Members and individual supporters contributed a combined $2,520 in donations to DGT Alumni Association and DGT Foundation in 2018. This total included $510 in dues and $788 in donations to the Association, and $1,222 in tax deductible contributions to DGT’s charitable arm DGT Foundation. 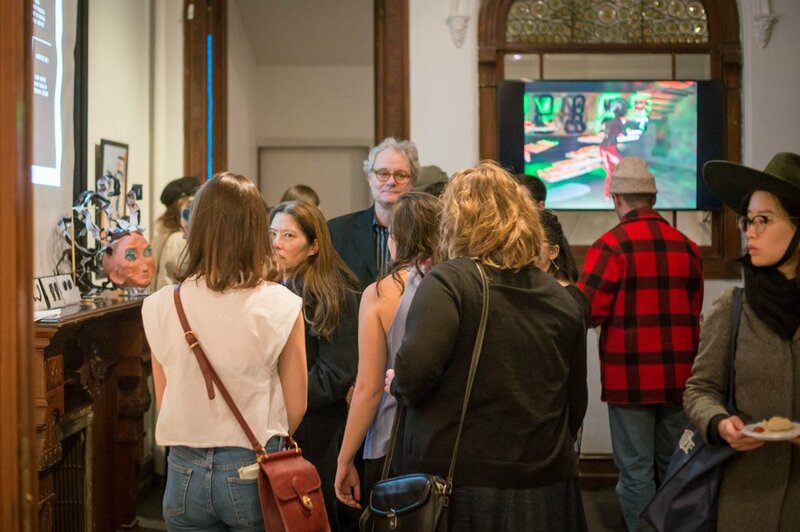 Gallery House's spring 2019 exhibit is themed "It's Not Me, It's My Image"
“Its Not Me, It’s My Image,” an exhibition curated by Gallery House Interns of Spring 2019, includes works that offer an experiential exploration of the implications of rapidly developing technology, social media, and the curation of multiple identities. Subject to periodic updates, the 2019 Calendar for DGT Alumni Association is now published at the DGT Website. Additionally, a Google Calendar of Events at the House is viewable by the public. Key events include monthly Board of Directors meetings via web-conference calls, quarterly membership meetings with light lunch and refreshments, opening and closing receptions for exhibitions produced by Gallery House Interns, a strategic planning retreat, the 4th Annual DGT Alumni Exhibit held in conjunction with Pratt Alumni Day, and an Annual Thanksgiving Dinner. A delegation of four DGT Alumni Association (DGTAA) members were present on Thursday, February 14, at the 107th Annual Conference of the College Arts Association (CAA). The Conference took place at the New York Hilton, Midtown, February 13 -16. At the Annual Membership Meeting of DGT Alumni Association, by acclamation, five members were elected to serve in 2019, for terms of office that will end at the next annual meeting in January 2020. Tom Fiorella, Electrical Engineering ‘74, a resident of Brooklyn, NY was re-elected to serve a second term as President. Asa Maria Camnert, Design Management M.P.S. ‘17, of Norrtalje, Sweden, will serve as Vice President. Elected for a third term as Treasurer was Tom Wong, Engineering ‘84, of River Edge, NJ. Former President of the Association (1974 - 1976, 2013 - 2017) Gil Gerald, Architecture ‘74, of Roosevelt Island, NY was re-elected as Secretary. Anne Marie Michael, Architecture ‘81, of Pompton Lakes, NJ, will serve on the 2019 Board as Sargent-at-Arms. Photos from DGT Alumni Association's collection of images of Greek Letter Fraternity Life at Pratt during the 1950's through early 2000’s will be among the items being exhibited on Pratt Alumni Day at the former fraternity house at 272 Clinton Ave.
All three members of the Gallery House Internship Program, fall 2017, have volunteered to support the program in fall 2018. Serving as Lead Coaches will be Laura Arike and Rddhima Goylan. The role of Curator of the DGT Annual Alumni Exhibit will be filled by Adam, Colello. Developing Connection, 1898 to the Present, opening Saturday, September 29, 2018, 12:00 to 5:00 p.m. will provide a window into the DGT story, especially over the past seventy years. The exhibit, held on conjunction with Pratt Alumni Day, will provide a view into the history of the organization, especially during the lifetimes of current members. Exhibited work will capture or recall treasured and memorable moments involving DGT members contributing to the life of the organization and to student life at Pratt. 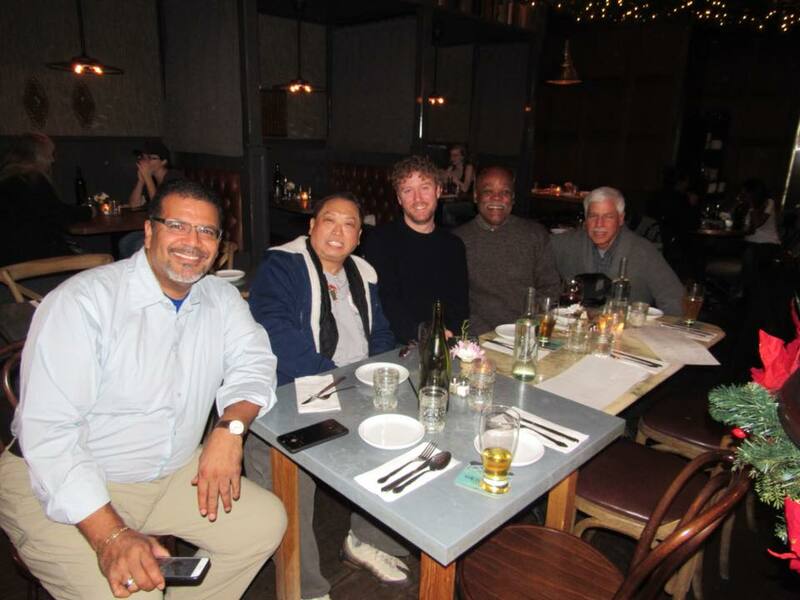 2017, as depicted in photos included in this article (click on photo to view all), pointed to the potential for successfully connecting and re-connecting DGT members on a grander scale. 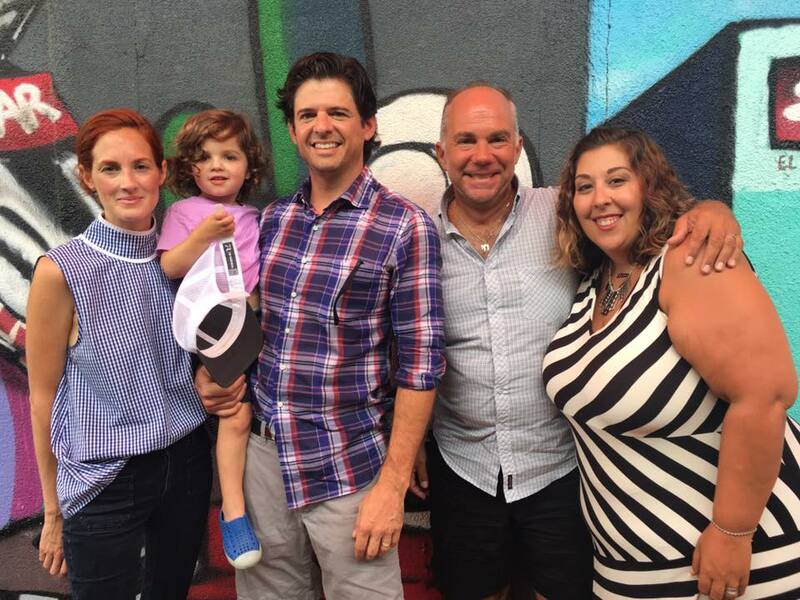 Captured are two Delta Gamma Theta brothers, Chase Hill and Harold Bernstein, and their families, gathered for lunch in Dallas to meet each other for the first time ever. John Comiskey and Marty Nystrom had not been to the House in decades until Pratt Alumni Day 2017. Also at the annual reunion, 10 brothers pose for the camera in the Chapter Room. That group represents five of the last six decades-50s, 60s, 70s, 80s, 90s, and 00s. The Thanksgiving Dinner gathering took place at nearby Putnam's Pub & Cooker. Bro. 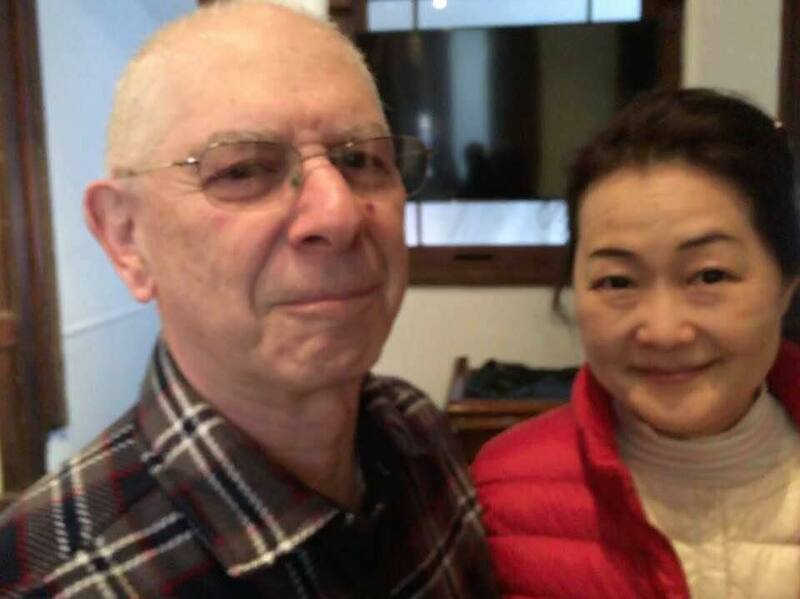 Pete Schirling, one of the first members to live at the House, and his bride, were visiting from Japan. They just had to come back to the House where Pete then reminisced and glimpsed at the mug with his name on it. Ariane Williams, a Spring 2016 Gallery House Intern, returns to support the program and experience the exhibit of a subsequent class of Interns. Two Fall 2017 interns, Rddhima Goylan and Adam Colello, smile for the camera. Finally, in the last image, Paul Fletcher and Aika Mukhambetova, both DGT alumni, are actively involved in making Gallery House happen. DGT looks forward to a future of more of these moments, for more DGT Alumni, in many more places than New York City. In early 2017 a Special Task Force of DGT Alumni was established to develop recommendations to build on the success DGT Alumni Association has had since 2013 in re-connecting and engaging its members who were once undergraduate fraternity or sister-sorority members, or since 2015, Gallery House Interns. The Task Force came up with a plan, released in early 2018. The Plan has objectives and a timeline organized under five goals: (1) DGT Member List and Member Information Easily Accessible to Members; (2) Distance Engagement Through Live Video Streaming from the House; (3) Make the DGT Website a More functional and Valuable Tool (for member connection and re-connection); (4) Regional and Out-of-state Member Get-togethers and Reunions; and, (5) Recover Missing Names and Contact Information for Members. There is an opportunity for DGT Alumni to volunteer as many hours or as few hours as you may have to carry out the plan. The tasks are all not time sensitive. There is an opportunity for all members, inclusive of individuals with skills, interest and experience in the field of communications (including webmaster, website administration, digital graphics design, blogging, and data entry and management). Volunteers are sought to research and obtain contact information for members, or to recover, catalog and display documents and artifacts of historical interest to DGT. Alumni members interested in planning or supporting the organizing of reunions, regionally or at the house, are also being sought. To explore how you could help, from wherever you are on planet earth, contact Gil Gerald, Secretary, by email to ggerald@dgtaa.org. Alumni Affairs, Office of Student Affairs, Center for Career and Professional Development, and Department Chairs serve as key points of engagement with Pratt Institute in 2017. In 2017 DGT continued a tradition of service to and collaboration with Pratt Institute. As indicated in the DGT Foundation's Annual Report, Gallery House is working effectively with various Pratt Departments and organizational units, especially Alumni Affairs, Center for Career and Professional Development, and Department Chairs. DGT Alumni Association coordinates with Alumni Affairs to participate in and contribute to the success of the Annual Pratt Alumni Day program. Pictured above, in early 2018, Pratt Institute rents the gallery space to host a daylong meeting of Department Chairs. The group requested the use of the space, and consequently DGT became a vendor to Pratt, perhaps for the first time. 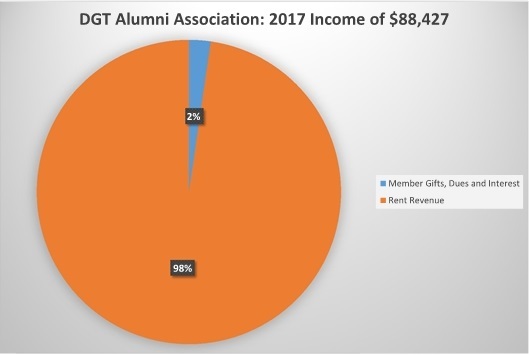 In 2017 DGT Alumni Association's income totaled $88,427, mostly from rental income (97.7%). All other sources, including member and non-member donations, dues, and interest totaled $2,037 (2.3%). Significantly, direct public support, including members donations, and other individual and business contributions, doubled from the previous year, increasing from $798.00 in the previous year to $1,490 in 2017. Similarly, as detailed in the 2017 Profit and Loss Statement, income from membership dues increased from $375 total in 2016 to $547 in 2017. Higher income in 2018 can be anticipated as 2017 was marked by higher than usual turnover in tenants with a resulting higher than usual vacancy and less than optimal income. DGT Alumni are increasingly responding, year by year, to solicitations to support DGT through donations and annual dues payments. The donations and dues received in 2017 were matched by additional donations made by these same members to DGT Foundation, the tax-exempt non-profit arm of DGT. For additional detail view the Balance Sheet for December 31, 2017 and the DGT Alumni Association's Federal Tax Return for 2017. DGT Alumni Association expended $93,834 in 2017 with a resulting pre-tax net operating income of -$5,407, a loss, as shown on the 2017 Income and Expense Statement. The loss was primarily due higher than usual renter turnover and resulting additional vacancy days at the DGT Home at 272 Clinton Ave., in Brooklyn, NY. There were also higher than usual costs for repair and upgrades to building systems. These expenses are reflected in higher contract services costs, and also in capital expenditures and depreciation costs detailed in the DGT Balance Sheet for 2017. At year's end, DGT had increased liabilities in the form of a credit card balance of $28,846. These funds were used primarily to cover capital expenditures mandated by building code requirements uncovered as part of a scheduled five-year, New York Fire Department inspection of the fire sprinkler system. The water main for the system, from the street to the house had to be replaced to meet current code requirements. A real challenge for the future is the need to raise significant capital funds for restoration and renovation work. In 2014 those cost were estimated at $1.25 million and are likely higher now. For additional detail, view the Balance Sheet for December 31, 2017 and the DGT Alumni Association's Federal Tax Return for 2017. (click of photo to view all) A required 5-year inspection of the fire sprinkler system by the New York Fire Department uncovered the need to replace the main valve for the sprinkler system. Complications in replacing the valve led to further discovery that repairs would necessitate replacing the water line, from the city's main supply line back to the house. Repairs required an upgrade of the line to meet current code requirements. These and other repairs required the expenditure of an unanticipated $28K. Active DGT Alumni members: Chuck Anderson, Ryan Baker, Harold Bernstein, William Border, Lance Bottari, Stan Brown, David Cerame, Yuda Drattler, Martin Eskow, Rodney Finkle, Tom Fiorella, Paul Fletcher, Vern Ford, Christine Friello-Fini, Gil Gerald, Jason Grefski, Ken Haber, Alan S. Hansen, Chase Hill, Ira Holst, Douglas Kupfer, Ramon Lacomba, Jon Levy, Bruce McKenzie, Michael Madia, Chas Martin, Marcus McLaurin, John Pagan, Fr. Michael Perry, Luis F. Rivera, Jr., Joe Pierz, Peter Schirling, Richard Shankey, Eric St. James-Lopez, Alexa Telano, Frank Verni, Diane Vita, James Vita, Thomas Wong, Chris Worsley and Josh Yavelberg. Donors to DGT Alumni Association: Ryan Baker, John Comiskey, Lance Bottari, Chris Duggan, Yuda Drattler, Marty Eskow, Vernon Ford, Christine Friello-Fini, Kostas Gerakaris, Gil Gerald, Jason Grefski, Paul Fletcher, Kenneth Hebel, Chase Hill, Michael Madia, Austin Lawther, Anne Marie Michael, Elycia Lerman, Howard Lee, and Thomas Wong. In-kind services: HYBEK (Ira Holst) Volunteers: Asa Maria Camnert, Tom Fiorella, Paul Fletcher, Vern Ford, Gil Gerald, Aika Mukhambetova, Eric St. James-Lopez, and Tom Wong. Exhibitors in the Annual DGT Alumni Exhibit: Manuel Castedo, Chris Duggan, Maria de Los Angeles, Paul Fletcher, Charles Martin, Robert Pasternak, Alan Rand, Carl Saieva, and Alexa Telano. Aika Aigherim, Co-lead Coach, Gil Gerald, DGT Foundation Board President, and Asa Maria Camnert, Co-lead Coach. Asa and Aika, former interns of Gallery House, emerged out of the spring 2017 program evaluation and planning process to lead the program in Fall 2017. In 2014, DGT Alumni Association formed DGT Foundation to carry out charitable activities consistent with the DGT Alumni Association's mission and vision. The mission of DGT Foundation is to promote creativity and artistic flourishing through a variety of educational and charitable activities; to foster leadership and professional development among students and professionals in creative fields; and to conduct and fund a variety of educational and charitable activities that benefit neighboring communities in the New York City region. DGT Alumni Association members volunteer with the DGT Foundation and provide financial support for the program as do a broader set of donors who are not members. Gallery House Internship Program is the signature and only program of DGT Foundation. Annually, at the beginning of fall and spring semesters, students apply to serve as interns who participate in a semester-long real-life learning experience in curating, promoting, fundraising, and managing a fine arts or design exhibit to benefit a local non-profit organization of their choice. Social needs and Issues addressed by beneficiary organizations have included LGBT immigration into the US, victims of acid attacks, and art instruction for school-age children. Between three and four students participate each semester in the Gallery House Internship Program and receive three credits towards graduation in their course of study at Pratt Institute. Gallery House Internship Program uses a private gallery space within the DGT Alumni Association’s residence at 272 Clinton Avenue. In early 2017, after three initial and successful semesters, fall 2015, spring 2016, and fall 2016, the program was paused for the spring 2017 semester to evaluate for ways to improve the program and better target marketing and outreach to attract relatively more undergraduate students. The program was envisioned in 2014 as a peer-led volunteer coaching effort in which program graduates coached and supervised subsequent groups of interns engaged in producing an exhibit. Thus a corps of former interns, still enrolled at Pratt for one or more years after their internship, would provide the volunteer peer-led leadership for program continuity. Coaches now receive a small, per session stipend as an incentive and in appreciation for their volunteer efforts. During spring 2017, seven of the eight interns from the previous three semesters all participated in the work of evaluation and program improvement for Gallery House. The group met to identify evaluation and planning tasks, and to agree on when and how the tasks would be performed. They assigned responsibilities for carrying the tasks out and tracked their completion. A week by week, ten-week coaching guide was developed and written so that there would be consistency from semester-to-semester in implementing the program while also providing for continuous quality improvement. The program's on-campus marketing approach was revised and the web-site content related to the program was improved. The team also collected sample forms and documented strategies that had been developed during the previous three semesters, and assembled them into a digital library for use and reference by future interns. Out of the process, two volunteers, Asa Camnert and Aika Mukhambetova emerged to serve as Lead Coaches for Gallery House Internship Program Fall 2017 and beyond. Rddhima Golyan, a Senior in Interior Design, Laura Arike, a Sophomore majoring in Art History, and Adam Colello, a Sophomore majoring in photography, represented an important change in the Gallery House Internship Program. Previously the program succeeded in mostly attracting graduate students. DGT Foundation's Gallery House Internship Program coordinates its on campus recruitment of applicants with the Pratt Center for Career and Professional Development (CCPD) and Pratt Institute's Office of Student Affairs. The internship opportunity is posted digitally through Pratt PRO, the go-to-resource for students and alumni seeking employment. Students apply through the DGT website, and International students studying at Pratt and accepted into Gallery House are further assisted by CCPD to comply with special requirements that apply to them. All students accepted into the Gallery House Program are assisted by CCPD to register to receive credit for their internship, and this support is performed in an efficient and timely manner. Through the Office of Student Affairs, the internship opportunity is posted on campus video screens and flyers about the program are distributed throughout campus. Pratt faculty participate in the program as exhibiting artists, and also provide information about the internship opportunity to students. Outreach to faculty is performed in coordination with Pratt Institute's Department Chairs who thus also help maintain and increase awareness about the program. As a result of quality improvement, the opportunity is now described in marketing materials as an internship program rather than a fellowship. Academic credit is offered to participants rather than a $3,000 shared fellowship grant, the practice for the first three semesters of the program. These strategies and changes resulted in achievement of the goal of recruiting and engaging undergraduate students, for the first time in more than a year. Previously, only once, in the fall of 2015, were undergraduate students engaged in the program; the re-calibration in spring 2017 worked! Gallery House Internship Program was the sole program of DGT Foundation in 2017. Donations totaling $7,043 to DGT Foundation included a $5,750 gift from DGT Alumni Association, and additional individual support of $1,292 from donors, primarily DGT Alumni Association members. This is more fully detailed in DGT Foundation's Statement of Activity for 2017. Additional information is also posted in the form of DGT Foundation's IRS tax return for 2017. DGT Foundation's expenditures totaled $7,661.58 in 2017. Major expenses included $5,233.31 in fellowship grants to students offered by Gallery House and disbursed in 2017. A total of $1,525 in business expenses included $1,000 in incentive stipends for volunteer coaching provided to students through Gallery House Internship Program. For further details see DGT Foundation's Statement of Activity for 2017. Also Available for review is DGT Foundation's 2017 IRS tax return. Photo credits: Ike Cheung, Pratt Visiting Instructor and Lecturer, and a DGT Alumni Association Member. Individual Donors: Lance Bottari, Manuel Castedo, John Comiskey, Paul Fletcher, Gil Gerald, Ken Haber, Alan Hansen, Kenneth Hebel, MIchael Madia, Anne Marie Michael, Fr. Michael Perry, Jakub Skoda, Greg Rajczewski, and Thomas Wong. Corporate Contributors and Sponsors: New York City Department of Cultural Affairs Material for the Arts Program, Pratt Institute Center for Career and Professional Development, and Pratt Institute Office of Student Affairs. Collaborating Partner/Beneficiary Organization: Children's Arts Guild. Fall 2017 Interns: Laura Arike, Adam Colello, and Rddhima Goylan. Exhibiting Artists: Tess Adams, Panyagal Charm, Xuan Chen, Carola Dixon, Nina Kou, Mark LaRiviere, Xander Maclaren, Michael Lee, Anna Marcelo, Christopher Smith, Anna Williams, Jingwen Zhu Volunteers: Asa Camnert, Paul Fletcher, Vern Ford, Gil Gerald, Aika Mukhambetova, August Ou, Maria Camila Pava, Eric St. James-Lopez, Rudolph Strelis, Alexa Telano, Ariane Williams, and Tom Wong. A freshman, a junior and a senior at Pratt Institute in Brooklyn, NY, successfully pulled off a well attended opening reception of Knowing Me, Knowing You on April 26, 2018. Samuel DiBiasi, Yejin Ha, and Christine Hwang, curated the exhibit as part of their Spring 2018 Internship with the Gallery House Program, an experiential learning opportunity provided by the DGT Foundation, the educational and charitable arm of the DGT Alumni Association. In a detailed report, a task force made up of eleven DGT alumni recommended a set of discreet yet synergistic short-term projects to continue to build a more meaningful program of activities interconnecting and engaging DGT alumni living in the New York City Metropolitan Area, elsewhere in the US, and internationally. Fifty one members paid their dues, including many who made an additional donation. The January annual membership drive raised a combined total of $2,000 in dues and donations. On Saturday, January 27, In a brief afternoon ceremony, the graduates of the fall 2017 Gallery House Internship Program, joined the ranks of the graduates of fall 2015, spring 2016 and fall 2016 committed to help continue the program, in a volunteer capacity, as they are able.